President Gurbanguly Berdymukhamedov wrapped up his stay in New York last week with a pitch to U.S. companies to invest in the ambitious-but-fraught Turkmenistan-Afghanistan-Pakistan-India, or TAPI, natural gas pipeline. Turkmenistan is touting the project as an era-defining undertaking that will help maintain vigor in the economies of fuel-hungry nations like India and Pakistan. TAPI has yielded disappointing returns among potential investors though. In May, Muhammetmyrat Amanov, the project’s chief executive, which is being led by the Turkmen government, predicted that financing for the $8 billion pipeline should be finalized by the end of the third quarter of this year. Amanov said that the TAPI Pipeline company was in talks with European export credit agencies and credit insurers ECIO, SACE and Hermes. These efforts do not yet seem to have borne the desired fruit. Activists tried to spoil Berdymukhamedov’s stay in New York with a protest rally outside the United Nations headquarters on October 1, but it takes more than that to dispirit the Turkmen leader. A couple of days later, Berdymukhamedov was back at home, getting up to his usual antics. His first mission was to don military garb and head out to a spot by the Iranian border in the Kopetdag mountains to ensure border personnel were doing their jobs properly. 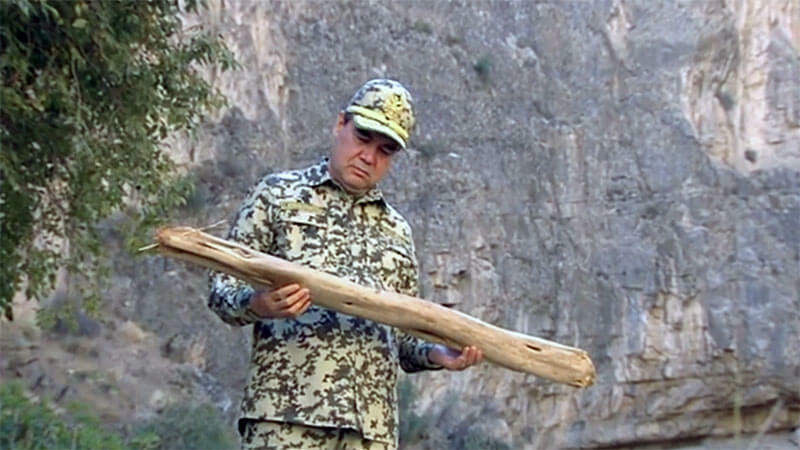 The exiled activist-run Chronicles of Turkmenistan published screen-grabs of the president warily inspecting a piece of wood, driving a military all-terrain vehicle and lecturing cadets. Borders are very much order of the day. On October 3, RFE/RL's Tajik service, Radio Ozodi, reported that Turkmenistan had finally begun to re-allow Tajik trucks that had been halted at its border for around a month to resume transiting through its territory. Ashgabat has been largely mum on this affair, although there are rumors that neighboring Iran may have instigated the blockade. Iran and Tajikistan are embroiled in their own, increasingly unseemly, standoff. The Turkmen route is deemed particularly important for supplying goods to Tajikistan’s largest industrial concern, aluminum company TALCO. As Azerbaijani news outlet Trend reported on October 5, with the Turkmen embargo in place, TALCO had to develop an alternative supply route via Azerbaijan, Russia, Kazakhstan and Uzbekistan. As Dushanbe-based Asia-Plus noted, this solution added thousands of kilometers and five-or-more days to ship goods to Tajikistan. With this Tajik kerfuffle going on in the background, it was all the more perverse that Berdymukhamedov should, on October 5, have presided over a government meeting devoted to discussing the outcome of a recent conference in the Caspian resort of Awaza on the “development of global transportation-logistical services.” The president’s ambition is to host a series of conferences to promote Turkmenistan as a logistical hub, but all the shindigs in the world cannot paper over the obvious problems that arise when dealing with a government as capricious as the one in Ashgabat. Always fond of staging international events, Turkmenistan this week played host to the general assembly of the Asia-Pacific Broadcasting Union, or ABU. Turkmenistan has only been a member of the Malaysia-based ABU, an analogue of the European Broadcasting Union, since 2015. If the European version of this organization is known at all, it is predominantly for organizing the Eurovision Song Contest. The ABU loves singing too, and Ashgabat accordingly hosted the seventh edition of the non-competitive ABU TV Song Festival October 2. Somewhat absurdly, the ABU marked its presence in Turkmenistan by awarding Berdymukhamedov a certificate in recognition of his “invaluable contributions to the development of mass media in the region.” It is hard to imagine what those contributions might have been — Turkmen television is so fatally dull that even Berdymukhamedov is occasionally given to complaining about it. Judging by some cursory online research, Turkmenistan’s ability to project its message to the outside is so inept that even the ABU TV Song Festival went almost entirely unnoticed outside the country. Then again, Iran's Tasnim News Agency did report that Ashgabat and Tehran have agreed to deepen “bilateral media interaction” and even jointly produce a television series, so there’s that. In other telecommunications news, the government announced on October 8 that it is undertaking a program to extend mobile phone coverage to all areas of the country. It will do so by installing 600 relay stations, which it is buying with money lent by the Saudi-bankrolled Islamic Development Bank. Turkmenistan contrived to significantly worsen internet and telephone connectivity for its citizens last year by booting out Russia’s MTS, one of the few major foreign investors prepared to brave the country. Now the government is promising that even 5G connections are within grasp – one to file under the believe-it-when-you-see-it rubric. Away from the glitz of the ABU gala, regular Turkmens still have to contend with the usual drudgery of survival. RFE/RL's Turkmen service, Radio Azatlyk, reported on a crush in a massive line at a bank in Ashgabat. The broadcaster also obtained a video of another large line, this time at a store selling baked goods in Dashoguz province. On October 1, the Alternative News of Turkmenistan relayed reports of a flour shortage, also in Dashoguz province. As happens pretty much every other week, heads have been rolling. At the October 5 Cabinet meeting, it was the turn of Serdar Gurbandurdyev, outgoing deputy chairman of the State Bank for Foreign Economic Affairs. TDH state news agency noted that Gurbandurdyev was also fired as Turkmenistan's representative to the Asian Development Bank, less than eight months after he was appointed.